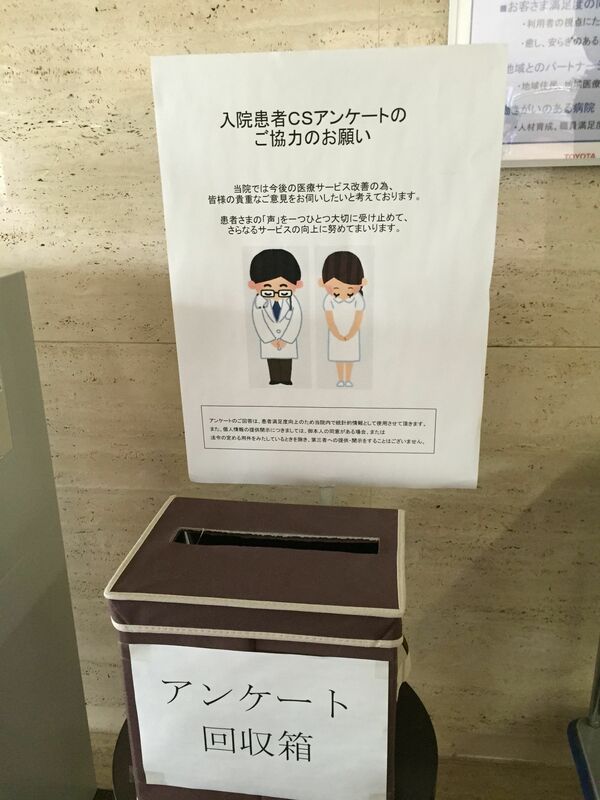 In an earlier post about my visit to Toyota Memorial Hospital (TMH) in Toyota City, Japan, last month, I wrote about how TMH’s renewed focus to deepen the practice of the Toyota Way by focusing on “respect for people” as the foundation. 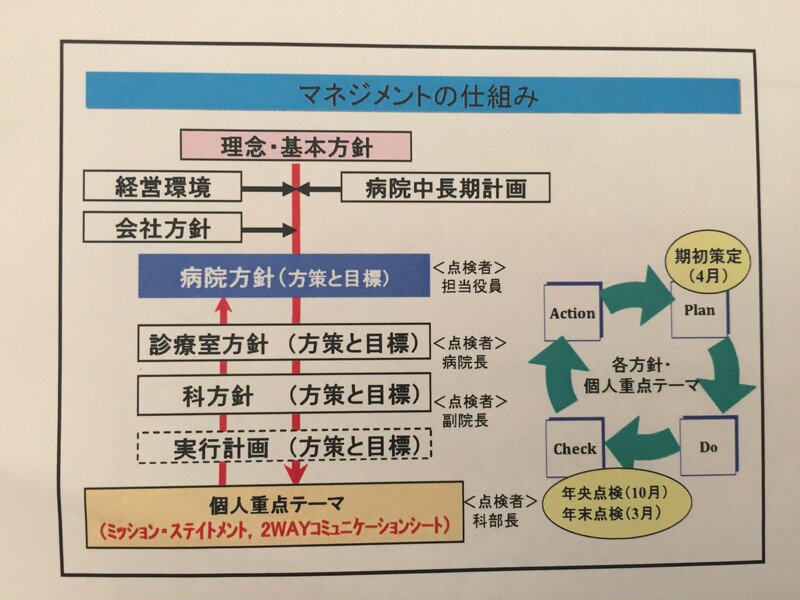 Many of you have asked questions in comments section in previous blog posts about these elements of the Toyota Way and the application of the Toyota Production System (TPS) at the hospital. In this post I share more of what I learned about how the hospital approaches challenge/goal setting and deployment, and the achievement of these goals through engaging staff and patients in kaizen. 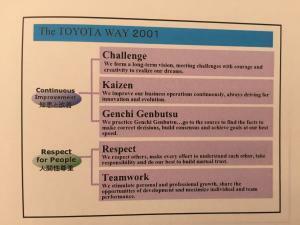 One of our hosts, Mr. Kamada, a 20+ year Toyota Human Resources leader from Toyota Motor Corporation who was deployed to the hospital only 15 months earlier, explained some essential elements of how Toyota people think about setting goals and challenges. He said that at Toyota, leaders should always have an ideal situation in mind (“forget reality”), as this will always keep you striving to improve even if you see obstacles in the way. Even if the goal for the year isn’t the ideal state, it is important to keep the ideal state as the final target. You always want to be reaching for something. Later in the day Mr. Sumiya explained that TMH has used hoshin kanri, which is a cascading strategy deployment process, for just over a decade. 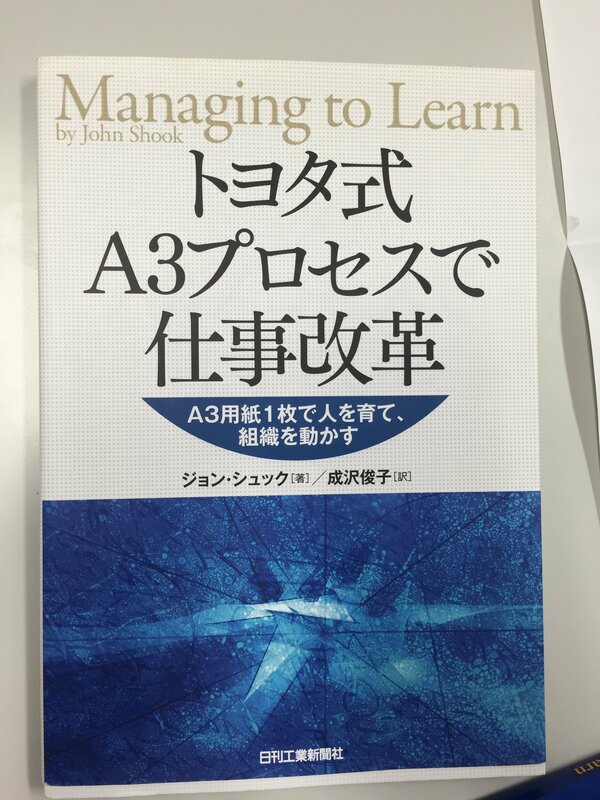 Hoshin kanri and the process of developing A3s (as described in John Shook’s book “Managing to Learn” – Mr. Yoshino was actually one the models of the manager role in the book!) makes it “clear on paper to see what managers really care about” in terms of people development and achieving organizational goals, Mr. Sumiya explained. 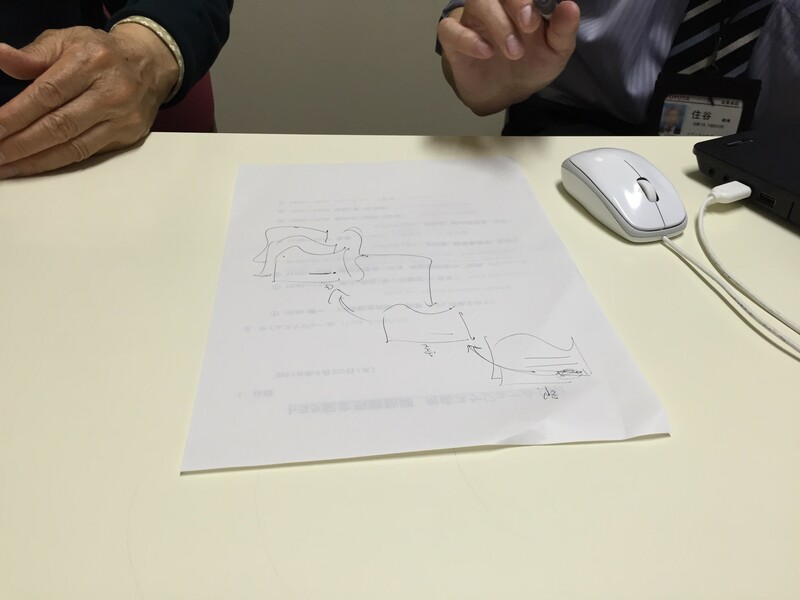 Mr. Yoshino (left) and Mr. Suymiya (right) drawing a hoshin kanri strategy deployment cascade from senior management down to front line. 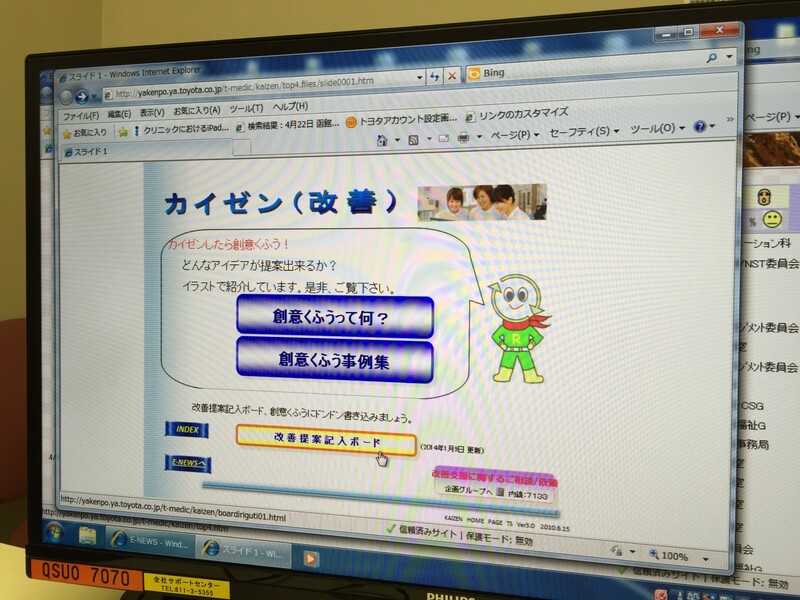 After this brief introduction to the hoshin kanri practice at the hospital, Mr. Sumiya and Mr. Yoshino spent an animated 20 minutes talking about hoshin kanri – all in Japanese. Mr. Yoshino regularly lectures on hoshin kanri as deployed at Toyota Motor Corporation during his tenure there and was very interested in learning how it is practiced at the hospital. I didn’t understand most of the conversation, but we agreed to meet again in the future to talk more about hoshin kanri and share ideas from each of our experiences – Mr. Yoshino at Toyota, Mr. Sumiya at TMH, and my experiences deploying hoshin kanri at health systems in the United States. (Just this week I just found out that Mr. Sumiya is able to meet with Yoshino and me next week when I make a final visit back to Nagoya before moving from Japan in early June). During this conversation, Mr. Sumiya also gave us an overview of the hospital’s intranet system. He showed us how the hospital’s important measures are visible to anyone internally at the organization and are listed with a corresponding visual indicator (smiley face, straight face or frowning face), depending on how the measure if performing against target. Measurements include safety, bed occupancy, length of stay, etc. (though I am not permitted to share specifics here). 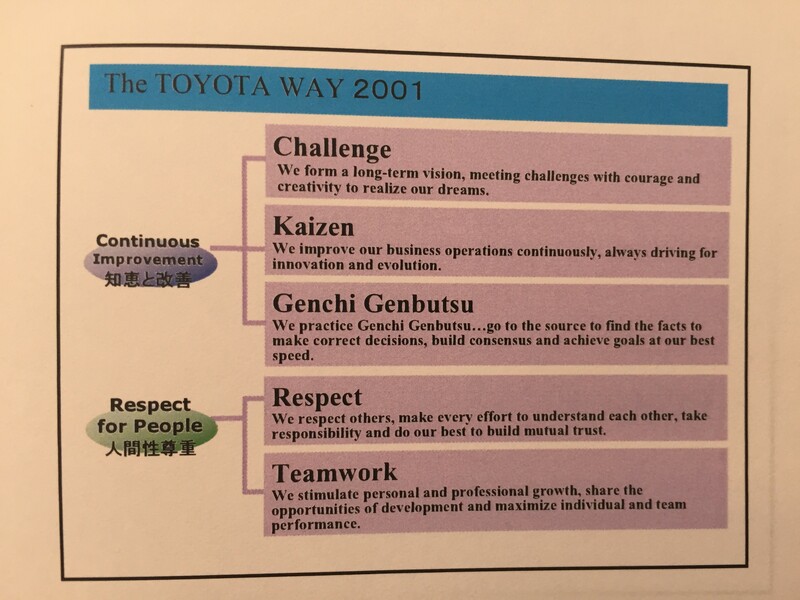 The second component of the Toyota Way’s continuous improvement core is the concept of “kaizen”, often translated itself as “continuous improvement”. In my visits to many Japanese organizations over the past year and half, it seems that kaizen most often refers to small incremental improvements usually developed by frontline workers. 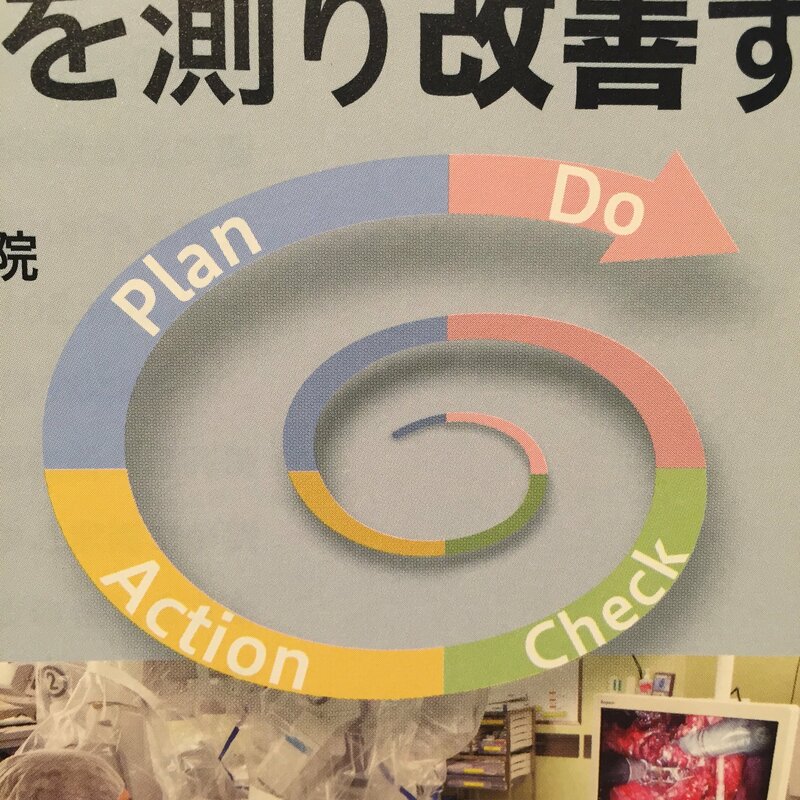 Toyota Memorial Hospital achieves its goals through hoshin kanri and kaizen P-D-C-A cycles. TMH’s kaizen system sounds like the “daily kaizen” programs that other organizations in Japan have described, including other hospitals such as Aso Iizuka or manufacturing organizations such as a corporate machine manufacturer and an electrician supplier. Mr. Kamada shared that initially the hospital adopted the automobile manufacturing plant’s kaizen template. However, they decided to modify the template to make it more tailored to a hospital environment. Mr. Kamada also commented that the hospital is currently looking to improve its other kaizen processes. He said that they don’t want to just copy what is done on the manufacturing side of the organization, because the hospital environment is different. He wants to figure out what will work best at the hospital. This in now part of his “challenge” that he described in deepening the Toyota Production System practices at the hospital. I didn’t get any further explanation of what their kaizen process is or how it is different than what the manufacturing side utilizes. However, in looking through my notes from the day this is a comment that stands out to me. 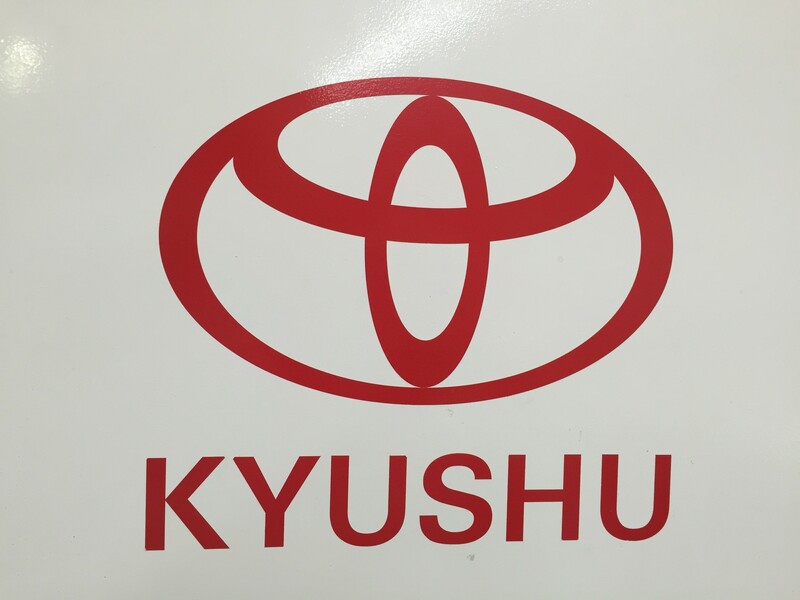 Organizations often try to copy Toyota’s methodology – or go on a site visit and see a process or tool and try to replicate it in their own organization, sometimes with success and other times with failure. I too have been excited by tools and techniques I’ve seen – as exemplified by the thousands of photos of have from site visits over the past decade. Examples of tools and how concepts were applied at other organizations can be valuable stimulators for ideas, but they need to fit the organization’s need. The principles are what should be applied – and the process and tools should be adapted for each individual organization’s culture. Our hosts explained that TMH revised the manufacturing kaizen template in 2008 and implemented its own kaizen suggestion system to solicit improvement ideas from the frontline. Their target is to help people understand what key things are needed to make kaizen work in their area. The hospital’s kaizen template includes a title, the suggested improvement, and a description what the process looks like after the suggestion was implemented. Kaizen ideas are submitted and shared electronically through the intranet system. Mr. Sumiya explained that between 600-700 kaizen ideas are submitted and implemented each year, and about 30% of the hospital’s staff put in kaizen ideas each year. TMH continues to try to make the process feel like “regular practice” for people to submit and encourages staff to see kaizen as part of their job. Kaizen is done during downtime, especially during the midnight shift when there isn’t as much patient care acuity. A manager’s job is to make sure that “it’s easy enough” for people to submit kaizen ideas and to make the improvements. The manager “should be passionate about the ideas” that their staff bring forward. Humble request for surveys to be returned. Toyota Memorial doesn’t just engage staff in continuous improvement, but they also actively solicits patient feedback to understand what customer’s value and as a source of improvement ideas. This past year the hospital has had a renewed focus on customer satisfaction. 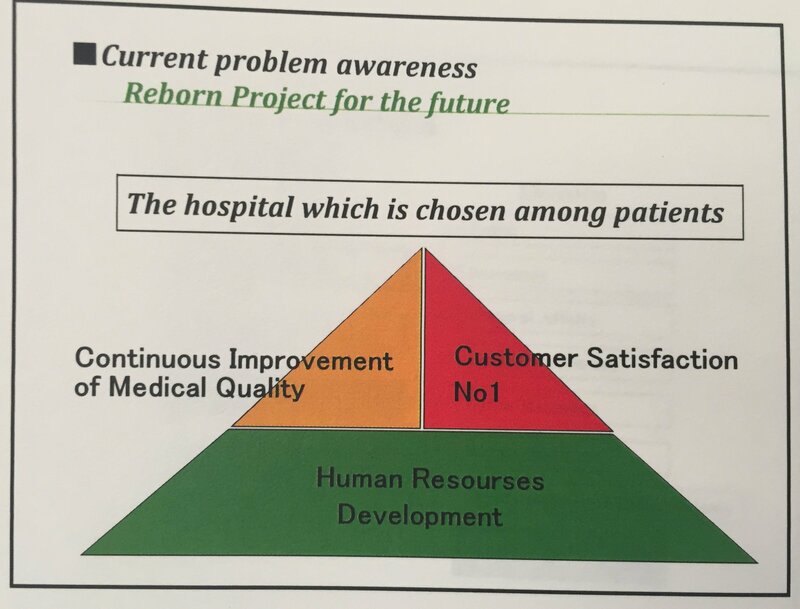 Upon Mr. Kamada’s arrival at TMH, the hospital started a “Customer Service Improvement” (CSI) program, which Mr. Sumiya is now responsible for leading. As part of the CSI program, patient input is actively solicited and shared frequently. All patients receive a survey either a month after they are discharged from the inpatient unit, or monthly if they were an outpatient. Roughly 40-50% of patients return the survey. Toyota Memorial’s target is to attain 90% or higher patient satisfaction. 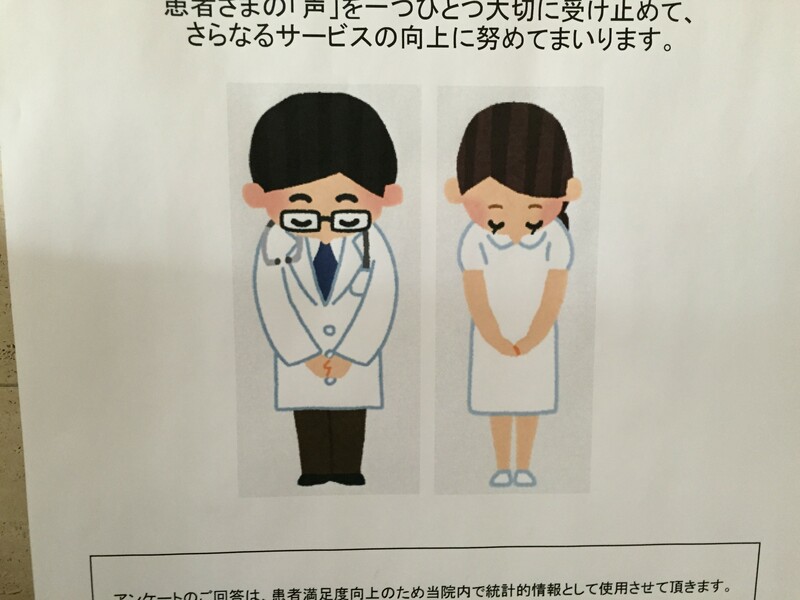 My host commented that he didn’t know any other hospital in Japan that conducts patient satisfaction surveys this frequently. Most other hospitals that he is aware of only conduct patient surveys once a year. At the end of each month, the data is collated is given to Mr. Sumiya’s department, which is responsible for disseminating and improving the patient experience. They are looking at automating the system next year so that surveys are not just paper-based. Mr. Yoshino examining the patient comments and associated responses as displayed in the foyer of the main hospital. The survey responses are given to the managers and staff each month with the purpose to “motivate them” to improve. Patient comments not only are shared with departments directly, but are displayed in the lobby alongside the countermeasures or actions taken by each department or doctor in response to the patient feedback. These posters are displayed at multiple locations in the hospital so that patients can see that their input in being listened to and acted on. Hoshin kanri, kaizen, & TPS at TMH – what questions do you have? I just found out that Mr. Yoshino and I will be able to meet with Mr. Sumiya again next week on my final trip to Nagoya. If you have any specific questions for him based on this post or any of my others about Toyota Memorial, please leave them in the comments section. I’ll do my best to follow-up as time (and conversation) permits. If you want to be the first to know when I publish a new post, sign up below to be added to the mailing list (if you aren’t already a subscriber).